A couple of weeks back I was asked to speak at TechWorld, a conference and expo organised by UK Trade & Investment. This year's event included the addition of the first TechCity Entrepreneur's Festival. The week-long festival incorporated a bootcamp, access to investors, a giant get-together with Silicon Valley Comes to the UK, pitch training and a pitch competition. In the light of so many overseas companies heading in to London, I thought a whistlestop tour of the UK's digital sector, location of clusters and London, in particular might be handy. Here's the presentation with all the research referenced. The work around the growth of micro-global firms from London Met university highlights a growing trend of international firms using London as their commercial base, using the relatively easy legal frameworks, access to capital/staff and timezone-friendly location to their advantage. Like I say, just a whistlestop tour, given the chance it'd be good to pull together further information from outside of London. It's clear that the South East dominates the digital scene in pure numbers, but I'd love to get a sense of the health of the specialist clusters outside the M25. Whilst I have to admit to some initial scepticism about TechCity, the focus on the area is definitely having an impact with the number of firms growing, between 250 and 600, depending on whose figures and methodology used. Either way, it's all in the right direction. Having said that, the Tech in TechCity, might be slightly mis-leading with a large number of agencies and digital-focused agencies including UX, creative, strategy and marketing making up the numbers. One to watch, and let's hope it continues to grow, the UK's economy certainly needs the inward investment and youth employment shot-in-the-arm this initiative offers. 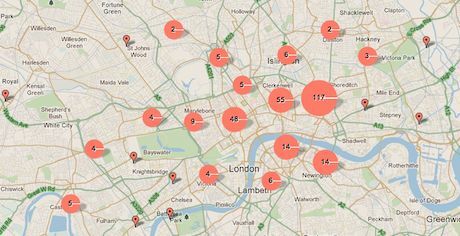 Photo (c) Duedil's London Startup Map. Submitted by Neil Cocker on Mon, 28/11/2011 - 1:03pm. Thanks for the feedback, that's really useful. I'll have a trawl through those stats. I know the SubHub guys really well, and had dinner with two of the guys from Cube Interactive just last week. They're definitely in a minority though, sadly. I organise events such as Ignite Cardiff and TEDxCardiff which tend to attract a very entrepreneurial/web/tech crowd, and I sit on the board of the Welsh Music Foundation so have a good ear to the ground in that sector too. But I'm starting to put together plans for more events aimed very squarely at scalable digital startups in Cardiff. I'll definitely list them here! Submitted by Neil Cocker on Sun, 27/11/2011 - 4:49pm. I'm intrigued by the stats used here that relate to the apparently high percentage of high-growth companies in Cardiff (slide 7). I'm wondering exactly what sectors this relates to? I'm trying to imprvoe the tech/web startup community in Cardiff, but when I put together a dinner for founders of high potential growth web companies I struggled to put 8 people around a table. There's a really poor "scene" here. Submitted by Sam Michel on Mon, 28/11/2011 - 11:54am. @Neil - looks like the link is broken on the slide, weird, it was working. This is the original report I used as the source material: NESTA: Geography of growth. To be fair, they focus on all high-growing companies not just those in the digital sector. Outside of London, I've often heard that it's difficult to bring people together, although not usually in the digital scene. I've noticed that when we recruit for the Digital Missions, that there are very few Welsh companies applying, it'd be good to see more and we've been talking to WDA and Welsh Government to make sure the word gets out. Two that spring to mind are Cube Interactive and Subhub. If you're putting together any other events in the area for digital folks, you're more than welcome to add them to our digital event listings.